Why are the major travel associations aligning themselves with anti-LGBT forces? The U.S. travel industry took a major hit when Donald Trump came into office. Between Trump’s travel ban and a general wariness by overseas travelers about the turn America was taking, the industry has seen a painful drop in tourists from overseas: 7.2 million fewer visits, accounting for about $33 billion in lost revenue. To combat the trend, a group of business and travel industry associations formed the Visit U.S. Coalition last January. It’s goal: get the Trump administration to “actively welcome international visitors to the U.S.” by creating a system that combines security with more visitor-friendly policies. Those are all laudable goals. The question is why does the Visit U.S. Coalition thinks the way to do that is to partner with the right-wing Heritage Foundation for an event that will proudly serve Chick-fil-A sandwiches? Both the Heritage Foundation and Chick-fil-A’s nonprofit arm have been on the vanguard of anti-LGBT attacks on issues like marriage equality and transgender rights. On May 9, the Coalition is sponsoring an event in Washington where the main speaker is Stephen Moore, an economist at the Heritage Foundation. The Heritage Foundation has been one of the most vocal supporters of Trump’s travel ban and has a history of wanting to restrict immigration, some of it branded as racist. In short, the Heritage Foundation favors the hostile policies that the travel industry says is costing them money. That’s bad enough. But it’s the Chick-fil-A sandwiches that’s the tip off that the event is political. Organizations do not normally advertise fast-food menus in media advisories for events. In this case, they did. Clearly, Chick-fil-A is being called out solely for its cache in conservative circles. And that comes entirely from its opposition to LGBT issues. 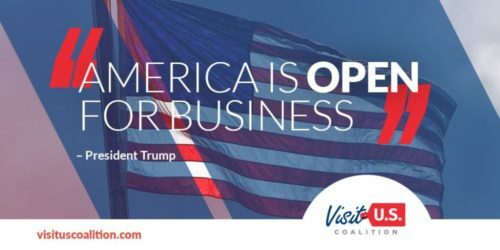 Pairing up with a company with Chick-fil-A’s reputation is certainly one way of telling LGBT tourists that they aren’t welcome to the U.S. Combine it with a main speaker from a group that believes those tourists shouldn’t have civil rights protections while visiting makes it only more egregious. Why groups like the U.S. Travel Association and the American Hotel & Lodging Association would want to do that is a mystery. The Coalition’s press contact did not respond to repeated requests for comment from LGBTQ Nation. But with a $33 billion hole to fill, you’d think the Coalition would be less inclined to sacrifice the lucrative LGBT travel market for the price of a greasy chicken sandwich.